The schedule allows instructors to post items in a calendar format. To enable the Schedule tool, go to Site Info >> Edit Tools >> check “Schedule” and click on Continue at the bottom. Then, click on Finish. The calendar has day, week, month, year and flat list views. A class schedule will contain events that pertain to only the class. A user’s Dashboard calendar will contain all events listed in all classes a user has joined, as well as personal events and activities the user inserts himself. Schedules can be printed as PDF documents. Enter the Schedule area by clicking on Schedule in the left menu bar. Click on the Add button (at the top of the window). In the dialog box, give your activity a title and description (if desired). From the pop-down menus, choose a Date, Start Time, and either Duration or End Time. Insert a message if desired (it’s optional). If the activity/event occurs more than once, click on the Frequency button and make appropriate choices for frequency. If desired, fill in the Location box for the activity. Choose Item type from the pop-down menu. Types include, but are not limited to: activity, class section, deadline, exam, special event, and more! If you’d like to add an attachment to the activity, click on the Add attachment box (see section on adding attachments for instructions). When all is completed, click the Save Event button to add the activity/event. The calendar will appear with the new event on it. By default, the calendar shows events between 8 a.m. and 6 p.m. To view events scheduled at other times, click on the Earlier link at the top of the calendar to see Midnight to 9:59 a.m., and the Later link at the bottom of the calendar to view events from 2 p.m. to Midnight. Calendar fields are the categories that you fill in for the calendar. Default fields include title, date, time, frequency, and item type. You can also add custom fields to your calendar. For example, you might want a field for specifying what items students should bring to an event, or any other field you’d like to add. Any fields you add will appear in the details for all of your calendar’s items. 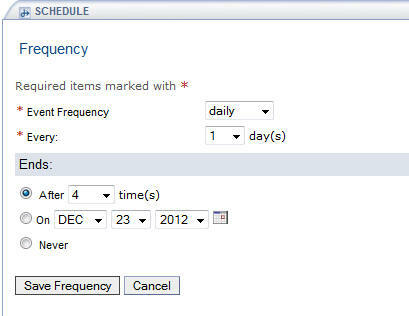 From the calendar view or from any schedule item view, click on the Fields button. In the Field name: box, type in a name and click the Create Field button. You can add as many fields as you like. When you’re done adding fields, click the Save Field Changes button to add fields or the Cancel button to exit without making any changes. The new fields will now appear in all schedule events. Any events that were created before any new fields were defined will have those fields empty. 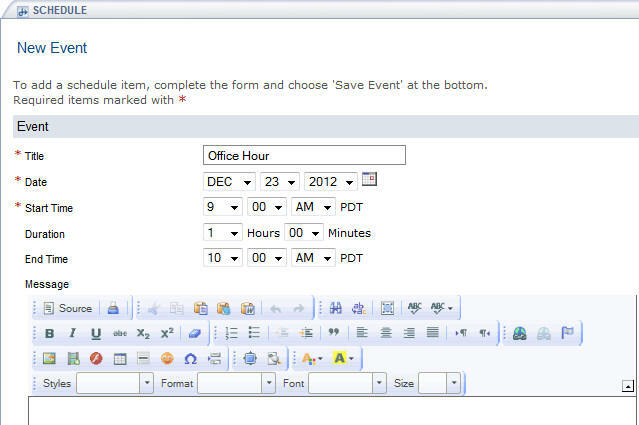 From the calendar view or from any schedule item view, click on the Fields button. Click the Save Field Changes button at the bottom of the page to delete the field(s) or the Cancel button to exit without making any changes. From the calendar view, click on a posted activity to display that activity/event. Click on the Revise button under the event listing. The same dialog box you saw when you created the event appears. Make any desired changes. Just above the Save Event/Cancel buttons at the bottom of the page, there is a drop-down box for you to choose if you want to modify all occurrences of the activity, or only this occurrence. Select your choice. Click the Save Event button to change the activity or the Cancel button to exit without making any changes. Click on the Delete button. 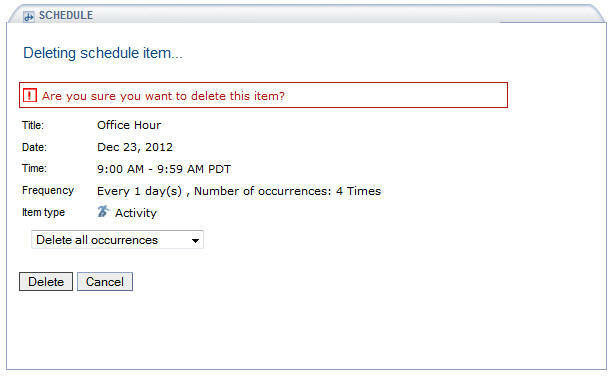 You will be asked Are you sure you want to delete this item? Click the Delete button to delete the activity or the Cancel button to exit without deleting the activity. 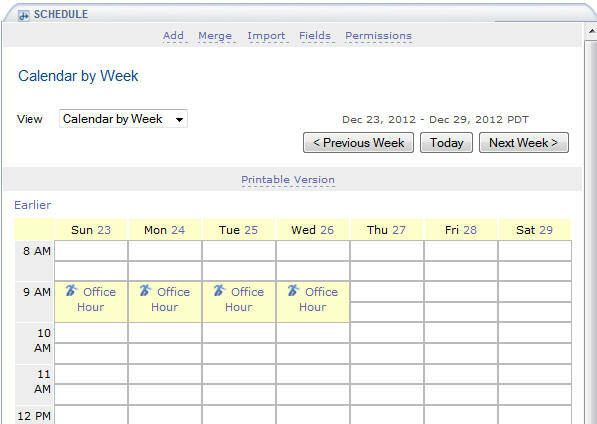 From the calendar view or from any schedule item view, click on Merge. Check the box(es) next to the calendar(s) you would like to merge with the calendar of the site you have open. Click on Save to merge the calendars into this site. Click Cancel to abort the merge. Be careful using the merge feature. Think carefully before using or you’ll end up with too many events on your calendar. 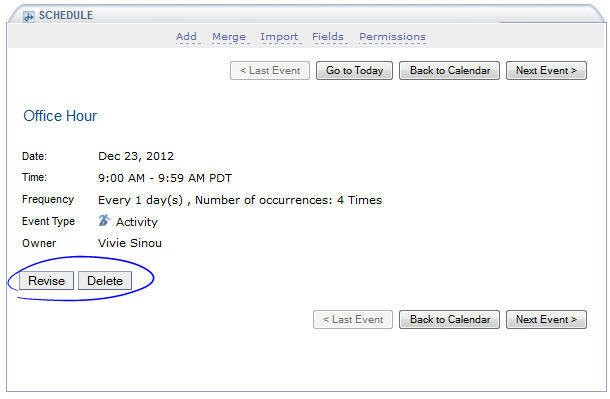 If you don’t like your merge results, return to the Merge feature in Schedule and click off the Show Schedule box. You can print an Adobe PDF file of any view of a schedule by clicking the Printable Version link at the top of the calendar. Whatever view that is current (day, month, year, etc.) is the view that will be created as a PDF. This is a one-page deal … if you want to print all twelve months, one month per page, you need to do it one page at a time. When you click on the Printable Version link, what happens depends upon how your browser is set to handle PDFs. In some cases, Adobe Acrobat Reader will launch and the schedule will open up. If your browser is set to have PDFs saved to the desktop, apparently nothing will happen, but if you look on your desktop, you should see a new PDF document entitled Schedule.pdf. When you open that up, it is your schedule.